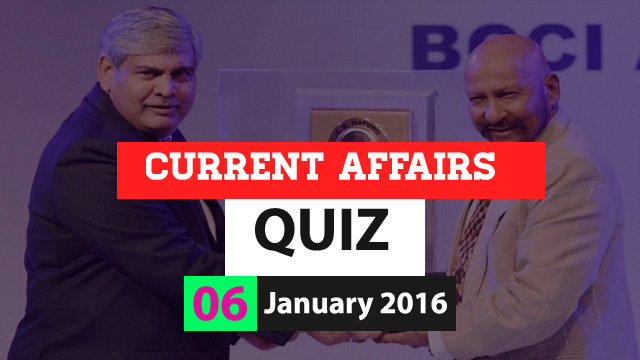 Hi Aspirants..here is the Current Affairs Quiz for 6 January 2016. 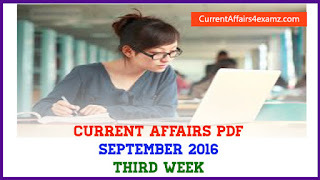 Trenidng topics include Ganga Gram Yojana, first hydrogen bomb test by North Korea, Col. C.K. Nayudu Lifetime Achievement Award, Zinedine Zidane as manager of Readl Madrid etc. Study the quiz questions & attempt the quiz. 1) Which bank on 6 January 2016 launched Immediate Payment Service (IMPS) across all its branches in association with the National Payments Corporation of India (NPCI)? 2) Union Government on 6 January 2016 has launched Ganga Gram Yojana to develop 1600 villages in which state situated along the banks of Ganga River? 3) Senior United Nations (UN) official Filippo Grandi from which country has taken the charge as new UN High Commissioner for Refugees (UNHCR) on 6 January 2016? 4) Which country on 6 January 2016 conducted its first hydrogen bomb test? 5) Which country on 5 January 2016 withdrew from the Under-19 World Cup Tournament to be held in Bangladesh citing security reasons? 6) Board of Control for Cricket in India (BCCI) on 5 January 2016 presented the ninth BCCI Awards 2014-15. Who was conferred Col. C.K. Nayudu Lifetime Achievement Award? 7) Who was appointed as the new manager of Real Madrid on 5 January 2016? 8) Union Cabinet on 6 January 2016 approved the Stand Up India Scheme to promote entrepreneurship among? 9) World's largest blue star sapphire that weighs 1404.49 carats was recently discovered in a mine in? 10) The book "Go Set a Watchman" written by which author has topped the 2015 US bestseller list?